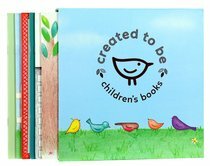 The Created To Be Collection is a boxed set including 6 inspirational children's books in a beautifully presented slip case to keep your set safely together and easy to get off the shelf. The perfect gift for precious little ones. A Beautiful Girl - a book to inspire girls to shine the beauty within. A Hero Is - a book to inspire boys to be everyday heroes. The Garden In My Heart - a book about sowing and reaping. What Love Looks Like - a book about how we give and receive love. Sooty & Snow - a book about boundaries and an adventurous chicken. Wilbur the Woolly - a book about trusting the good shepherd. About "The Created to Be Collection (6 Books In Slipcase)"
Nikki Rogers is a mother of two and lives with her husband on the Gold Coast, Australia. Nikki originally started writing children's stories with values that she wanted to instill in her own children. Her books are written in a positive language and will help instill a strong sense of moral whilst encouraging each child with the truths that they are unique and special. "All my children's books are written with this in mind: that I would inspire children and parents to be all they were created to be. I also have a desire to see people, especially children all over the world set free from whatever holds them bound and so the profit from my books goes toward various world missions that fight for this cause." Being trained in primary education, Nikki has also written lesson plans to accompany her books. These free resources are available online for classroom or home use.